JAMAICA: The Petroleum Corporation of Jamaica (PCJ) has secured funding from the US Trade and Development Agency (USTDA) to complete a feasibility study for an offshore wind project off the Jamaican coast. The grant, for an undisclosed sum, will be used by the government-owned PCJ to carry out a study in to installing the first offshore wind project in the Caribbean. PCJ has appointed US firm Keystone Engineering (KEI) to conduct the study. Keystone has experience designing offshore wind foundations — its twisted jacket design is being used to support a met mast at US Wind's Maryland offshore wind site in the US. Keystone also acted as foundation design engineer for the US's first offshore wind project, the 30MW Block Island site off Rhode Island. "The Government of Jamaica has identified renewable energy development as a major pillar in its strategy for energy security," said PCJ group general manager Winston Watson. "This study will help the PCJ to get valuable data that can attract overseas investment for the development of our offshore wind resources and we look forward to a fruitful partnership with USTDA and with KEI," Watson added. Jamaica relies on petroleum imports to generate 90% of its electricity, according to the country's ministry of science energy and technology. "The study will help to develop new energy resources and create potential commercial opportunities for US technologies in Jamaica," said USTDA regional director Nathan Younge. 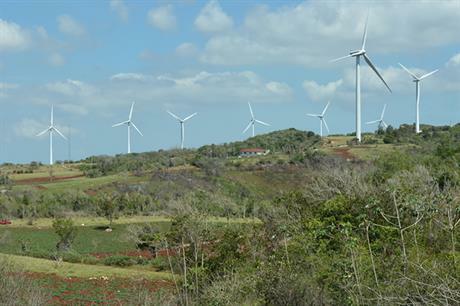 According to Windpower Intelligence, the research and data division of Windpower Monthly, Jamaica has 75MW of installed onshore wind capacity. "We are optimistic that we can use this study to realise an offshore wind farm in the near future," said KEI offshore renewables general manager, Ben Foley.